Steve Reeves and Gianni Garko star in an enjoyable Historical Peplum. Retromedia US R0 DVD. 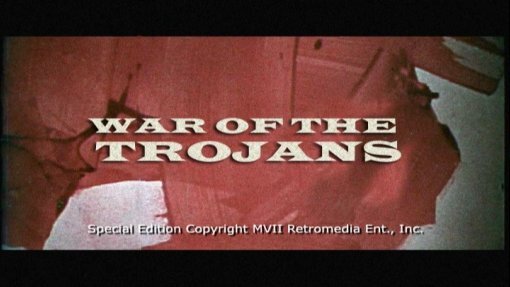 Quite rarely for the Italian exploitation films, War of the Trojans is a direct sequel - in this case to the earlier Trojan Horse (1961) and continues the story of Aeneas (Enea), leader of a band of survivors from the destruction of Troy. The story is based on Roman poet Virgil's epic tale the Aeneid, although it cuts out the first half of the work, telling of their journey and begins with the tribe already settled in Latium. Most of the major characters and plot are taken directly from the poem, including the relationships between the King of Latium and his daughter and between his wife and Turnus - the legendary lovers Nisus and Euryalus are also included, although the film completely removes any hint of romance between them (at least in the film's English language version). The storyline proceeds in the same way as Virgil's tale, climaxing in the great fight between Aeneas and Turnus. Unlike its forerunner which was a full Historical Epic, War of the Trojans is a more traditional Peplum, with the theme of a tribe being opressed by an evil ruler a rather common cliché. The historical aspects of the earlier film are still evident in the film's complete lack of gods and mythology and the more epic than usual battle scenes but it is certainly never on the same scale as the true Peplum Epics. The film moves along quite slowly but the characterisation is never that strong and the political wrangling between the different rulers is only lightly covered, however it does avoid dragging and builds up to an effectively tense and dramatic climax. More at home as a producer, the director Giorgio Venturini had previously worked on a couple of Historical Pepla and his experience shows in the well helmed dialogue scenes and a very impressive flashback sequence when Aeneas sees a wall painting of Troy being defeated, intercut with footage from the first film. Unfortunately the battle scenes here never look so good - although a few wide shots show a clearly large selection of extras, the extensive use of close-ups make the battles seems a lot smaller in scale and it is often hard to tell what is going on. The various soldiers sport an amazing array of costumes, even down to authentically shaped (if rather comically oversized) Etruscan helmets. Composer Giovanni Fusco who scored the first film provides another suitable soundtrack this time around. Peplum favourite Steven Reeves appears in his penultimate sword and sandal film, reprising his role as Enea and giving another typically fine performance - it is proof of this film's historical rather than traditional Peplum status that he doesn't get any "strong man" scenes. As the lead villain, Spaghetti Western favourite Gianni Garko gives a strong performance in one of his earliest roles. The omni-present Euro-cult star Giacomo Rossi-Stuart plays the doomed lover Euryalus opposite Sergio Leone's regular stuntman Benito Stefanelli as Niso (who also receives a credit as this film's 'fencing master'). War of the Trojans is an interesting attempt to follow up the splendor of Trojan Horse, sadly director Giorgio Venturini is simply not as adept at handling the battle scenes and the film lacks the epic flavour of its forerunner, while the well directed dialogue scenes are let down by a rather uninspired script. Fortunately Steve Reeves provides another good performance and the film is generally enjoyable - Peplum and Reeves fans will want to see this one but genre newcomers will find many better titles to watch first (such as this film's predecessor). Who is it for? Fans of Peplum films and Steve Reeves should enjoy this although it is not the best of either canon. The Trojan Horse (1961) Steve Reeves plays Aeneas in the original, epic film. Reeves and Gordon Scott play the descendants of Aeneas in this epic retelling of the life of the brothers who founded Rome. The print is certainly not pristine, colours are rather muted, there is a lack of detail and there is noticable print damage throughout most of the film - however it is always watchable. Audio English mono - the dialogue comes through fine although there are some jumps. Availability Only as part of the Steve Reeves Collection - a two film, single disc collection also featuring the far superior Steve Reeves, Mario Bava epic Giant of Marathon (1959). Other regions? Available in Germany as part of the Kino Kolossal collection and from Filmax in Spain with anamorphic widescreen prints but no English options. Available on public domain US releases but with low quality prints. Cuts? The film is believed to be uncut. The print has English titles. Not the best of the genre, some good performances make this reasonably enjoyable and it will certainly be of interest to genre fans. The print is not perfect but is at least the original aspect ratio and always watchable - the best English friendly version available. See our reviews of more films starring Steve Reeves or Gianni Garko and other Peplum films. All text in this review written by Timothy Young - 15th September 2008.